Following impossible demands for military service from Edward I, King John Balliol forged what would become known as the 'Auld Alliance' with France prompting the First War of Scottish Independence. 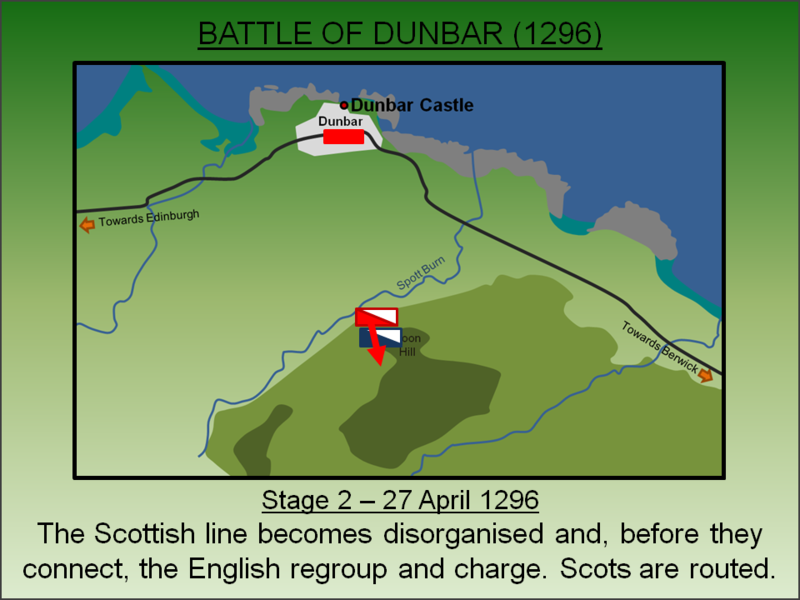 At the Battle of Dunbar (1296) the English achieved a decisive victory that saw the overthrow of the Balliol regime. Following the deaths of Alexander III and his only heir, Margaret, Edward I of England was asked to arbitrate between rival claimants for the Scottish throne. At Berwick Castle, on 17 November 1292, the English King announced his verdict in favour of John Balliol whom it was anticipated would be a reliable vassal. However, Edward's excessive demands for men and money to support a war with France placed the new Scottish King in an impossible position. He was left little choice but to rebel and sought to agree a mutual defence pact with France. Outraged Edward raised an army to deal with the threat and by March 1296 the two countries were at war; the Scots launched a failed attack on Carlisle Castle on 26 March but this was followed by a brutal English assault on Berwick on 30 March. The sacking of the latter, Scotland's largest port and a thriving mercantile community, was designed to awe King John into submission. After one month militarising Berwick, Edward commenced preparations for penetration into southern Scotland. A key installation along the coastal road was Dunbar Castle which although owned by Patrick, Earl of March - who supported Edward I - had been handed over by the Earl's wife, Marjory Comyn, to the forces of King John. On 23 April 1296, as a precursor to advancing on to Edinburgh, Edward sent John de Warenne, Earl of Surrey north to secure Dunbar Castle. Fully aware the defences were inadequate to repel such a significant force, the garrison sent a plea for help to King John who was camped at Haddington, some 10 miles to the west. 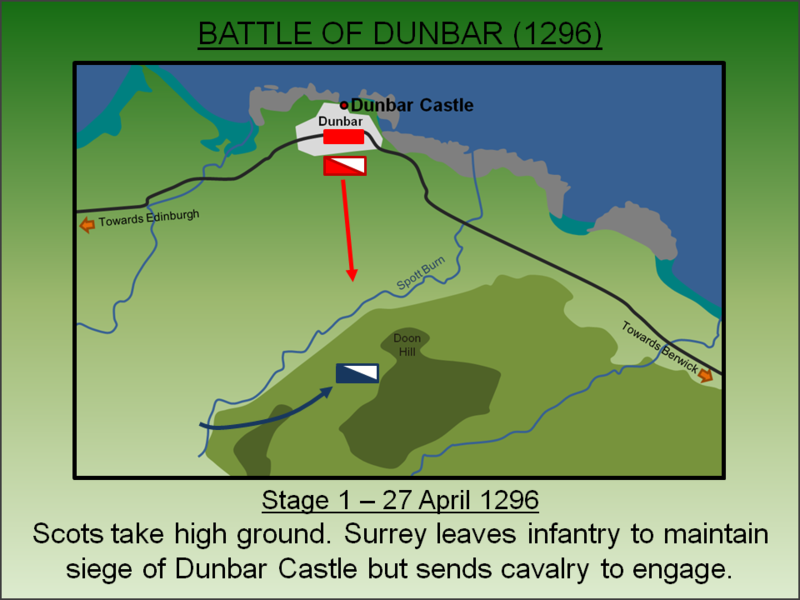 As Surrey arrived at Dunbar, immediately beginning siege-works against the castle, King John dispatched a force to fight the English. 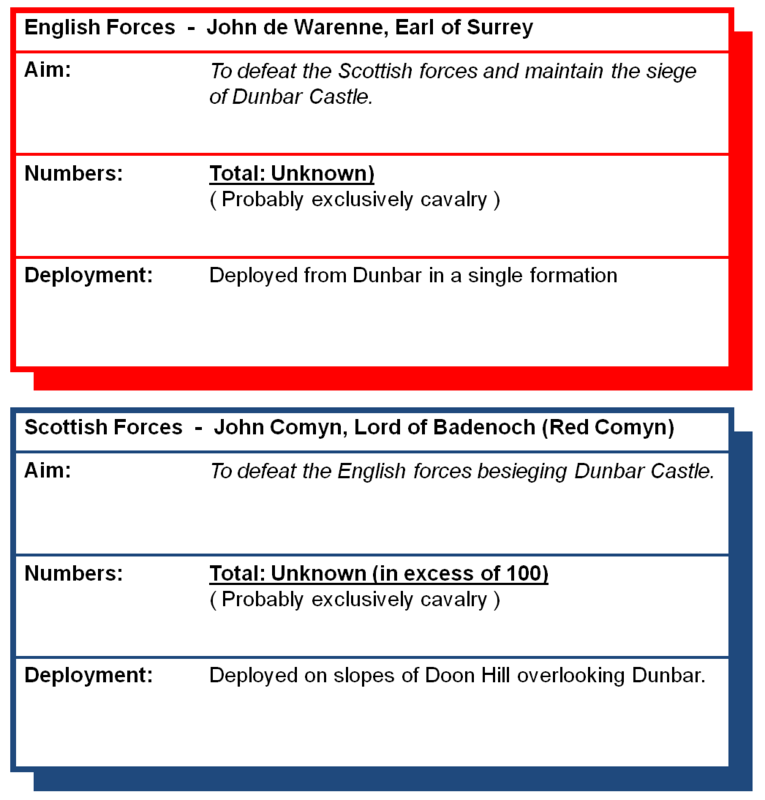 Under the command of John Comyn, Lord of Badenoch (Red Comyn), the mounted elements of the Scottish army advanced on the English position. The English army was led by John de Warenne, Earl of Surrey - John Balliol's father-in-law and a competent military commander with previous experience fighting in Wales. It is likely his force consisted of almost entirely mounted men. King John had not accompanied his army to Dunbar and instead placed John Comyn, Lord of Badenoch (Red Comyn) in charge. However, the Scottish forces also included numerous other high status magnates including John de Strathbogie (Earl of Atholl), Alexander (Earl of Menteith) and William (Earl of Ross) all of which undoubtedly confused the command chain. The Scottish forces arrived on the morning of 27 April and formed up on Spottismuir - a ridge of high ground overlooking Dunbar. Undeterred by the formidable Scottish defensive position, Surrey left his infantry to maintain the siege of Dunbar Castle but moved his mounted forces to engage the Scots. In order to assault the Scottish position, the English had to cross the Spott Burn. This seemingly disrupted their lines for Comyn, with his forces now on the slopes of Doon Hill, misinterpreted the manoeuvre as one of retreat. Hoping to capitalise on the disruption to the English lines, he ordered the Scots to charge. The Scottish charge consisted of a disorganised descent down the hill. By contrast the English, having now forded the Spott Burn, reformed and counter charged routing the Scots. Whilst fatalities seem to have been limited - records suggest only one Scottish Knight, Sir Patrick Graham, was killed - significant numbers of Scotland's best warriors were captured including John Comyn, John de Strathbogie (Earl of Atholl), Alexander (Earl of Menteith), William (Earl of Ross) and perhaps as many as 100 Knights. A handful successfully escaped into the Ettrick forest. The battle was a disaster for the Scots and saw over 100 high status prisoners taken. With the arrival of Edward I and the main English army on 28 April 1296, Dunbar Castle surrendered to the English. In the weeks that followed most of central and southern Scotland came under Edward's control with key castles - most notably Roxburgh and Stirling - being handed over without a fight. On 21 June 1296, perhaps influenced by the fate of Llywelyn ap Gruffudd in the earlier Wars of Welsh Independence, King John capitulated to Edward I. On 8 July, at Montrose, he was stripped of his Royal regalia and forced to abdicate with Edward I choosing to keep the Scottish throne vacant. The Wars of Scottish Independence had seemingly ended but, just 10 months later, William Wallace would kill William de Heselrig, High Sheriff of Lanark and start an uprising that would later see Surrey humiliated at the Battle of Stirling Bridge (1297). Armstrong, P (2003). Stirling Bridge and Falkirk 1297-98: William Wallace's rebellion. Osprey, Oxford. Black, C. S (1936). Scottish Battles. Brown and Ferguson, Glasgow. Burns, W (1874). The Scottish War of Independence Its Antecedents and Effects. James Maclehose, Glasgow. Cauldwell, D.H (1998). Scotland's Wars and Warriors: Winning against the Odds. Historic Scotland, Edingburgh. Clark, D (1996). Battlefield walks : Scotland. Sutton Publishing, Stroud. Cyprien, M and Fairbairn, N (1983). A Traveller's Guide to the Battlefields of Britain. Evans Brothers Ltd, London. Dodds, G.L (1996). Battles in Britain 1066-1746. Arms & Armour, London. Donaldson, G (1997). Scottish Historical Documents. Neil Wilson Publishing, Castle Douglas. Dunbar, A. H (1899). Scottish Kings: A Revised Chronology of Scottish History 1005-1625. David Douglas, Edinburgh. Forbes, G. Scottish Battles: 86 A.D. to 1746. Lang Syne, Glasgow. Green, H (1973). Guide to the Battlefields of Britain and Ireland. Constable, London. Hamilton, J (2004). Scottish Battles. Geddes & Grosset, New Lanark. Kinross, J (1979). The Battlefields of Britain. London. Lancaster, J.H.D (2014). 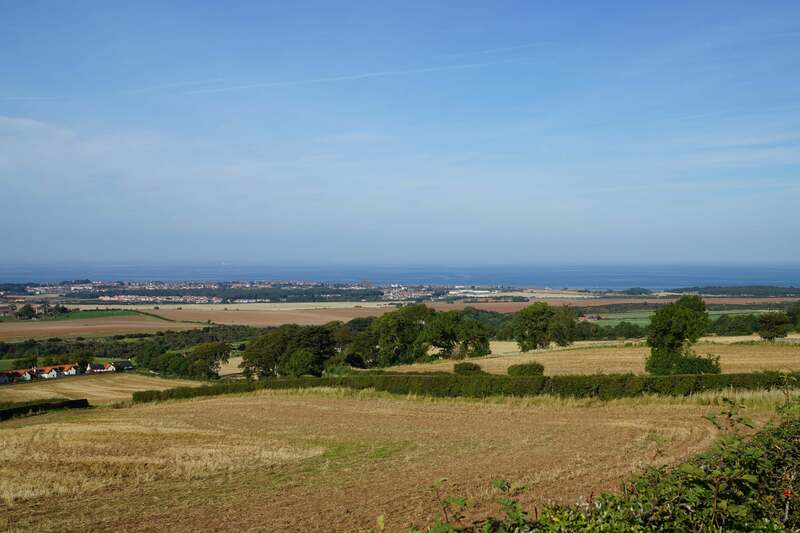 Dunbar: Battlefield visit notes and observations. CastlesFortsBattles.co.uk. Matthews, R (2003). England versus Scotland, The Great British Battles. Leo Cooper, Barnsley. Morris, M (2009). A Great and Terrible King: Edward I and forging of Britain. Windmill Books, London. Ordnance Survey (2015). Dunbar. 1:1250. Southampton. Ordnance Survey (2015). East Lothian. 1:1250. Southampton. Sadler, J (2010). Scottish Battles. Birlinn, Edinburgh. Smurthwaite, D (1993). The Complete Guide to the Battlefields of Britain. Michael Joseph, London. There is no monument marking the battle but a good view of the terrain can be seen from Spott Loan. 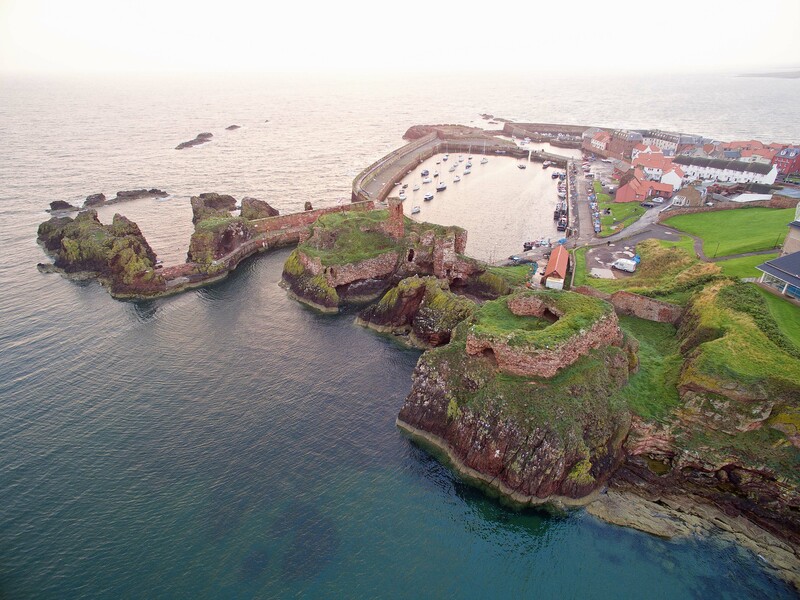 The castle, the siege of which prompted the battle, can be seen in central Dunbar but is in a poor state of repair with a portion having been destroyed to create an entrance for the harbour. No access is allowed to the ruins. Battlefield. The battlefield viewed from near Doon Hill where the Scots initially deployed. The English rode out from Dunbar in the centre of the picture. Dunbar Castle. The castle is ruinous with no public access. The battlefield is best viewed from Spott Loan but there are no sign-posts nor any monument. On-road parking is possible. The castle is located next to Dunbar Leisure Centre which has a car park. (c) Copyright 2019. Part of the CastlesFortsBattles.co.uk network. Terms and Conditions.